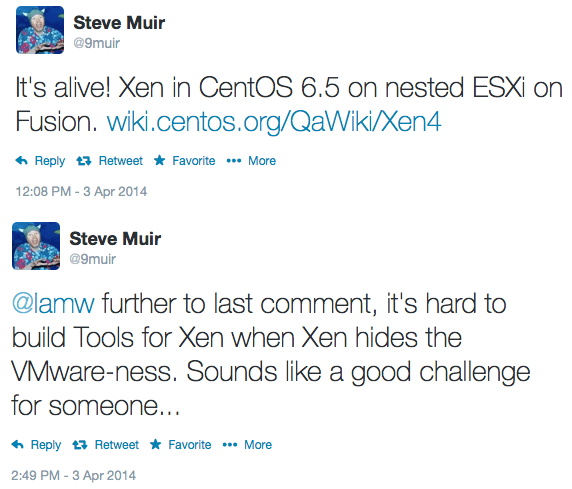 I recently saw an interesting tweet from former VMware colleague Steve Muir who use to run our VMware Academic Program (VMAP). From the looks of things, Steve has been exploring the virtual rabbit hole by performing some cool multi-level vInception by running Xen in a Nested ESXi Virtual Machine running on top of VMware Fusion 🙂 I wonder if he has tried to run a VM in the Xen instance yet? Anyway, the thing that caught my eye was not the fact that you could run a Xen Hypervisor within ESXi, this has actually been done before in the past. What was interesting to me was the fact that he could not get VMware Tools to show up when Xen is installed and running. I was actually curious to see why this was the case and while waiting for some of my physical hosts to finish rebooting, I figure I give this a go myself. I was leveraging the Wiki page that Steve had initially provided but that gave me some issues as Xen would kernel panic upon a reboot. 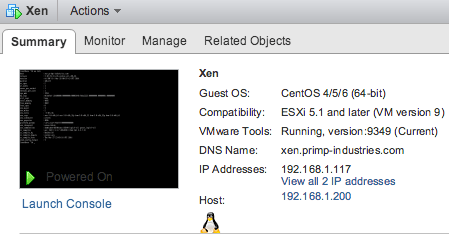 How to run Nested Mac OS X guest on ESXi VM on top VMware Fusion? How to properly clone a Nested ESXi VM? Are you sure CentOS guest is booted up with Xen and not just the linux kernel?VMtools uses a backdoor IO port to communicate with the esx host, and unless Xen has special patches to pass this port through the communication might not be possible.